Score tickets to England’s rugby matches at Twickenham! Fuller’s pubs and London Pride are giving you the chance to win a double pass to one of three home rugby games at Twickenham Stadium this winter – where you will watch two of the six countries battle it out for the champion rugby title for 2019! England vs France: Sunday 10 February at 3pm, Twickenham Stadium. England vs Italy: Saturday 9 March at 4.45pm, Twickenham Stadium. England vs Scotland: Saturday 16 March at 4pm, Twickenham Stadium. Read on find out how to enter to win one of three double passes to watch the rugby action. 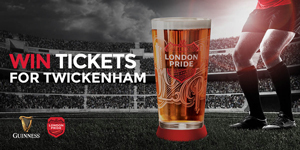 Entering is easy – simply buy yourself a pint of London Pride or Guinness from one of our participating pubs, or score tickets online through our Made of Rugby game. Each pint of London Pride or Guinness purchased from a Fuller’s managed pub between 1 February and 10 February scores you a code to enter. Click here to find a participating pub. Click here to play Made of Rugby. The competition is open until 8 March 2019. To view our full terms and conditions, click here. To enter your code from purchasing London Pride or Guinness from a participating pub, click here. To play the Made of Rugby game for a chance to win, click here.